I have been asked to talk about evolution tonight so I am going to talk about involution instead. That is evolution the other way up. It is a very important concept because the peculiar thing about Western concepts of evolution consist in that they imagine some primary substance with no qualities of any significance, other than mere existence and then they proceed to draw out of this empty hat intelligent beings through a series of fortuitous collisions of assumed atoms. Now, if we take evolution to signify ‘bringing something out’ from a situation or a substance, then we have to account for the qualities that emerge being in the substance from which they emerge. So, if a human being exists, we have to say that the configuration of forces in the human being must be an inherency of ultimate reality, the origin from which humanity came. So, we have to posit inside the original substance, in some manner, such attributes that when they are developed will be equivalent to a human being. The first thing to observe is that a human being has certain attributes that we call intelligence, and so on, which enable him to do something that is utterly beyond argument. I mean that it is beyond argument that he does it, namely argue. Anybody who argues that mankind does not, in fact, argue is refuting himself. So we have to posit that in the primary substance of reality, whatever the word ‘substance’ means, there are certain attributes, which when developed, constitute and argumentative being. Now, although western thought has, in the last thousand years been materialistically biased, in the Twentieth Century we have seen, effectively the material basis of reality seriously questioned and finally demonstrated to be really mass-energy. If we therefore posit that reality, whatever it is, has, as its first manifestation, energy, we cannot be far wrong. Now we have to discuss each term that we use, because if we do not discuss the term and we merely use it without definition we can be in serious trouble because the term itself contains, telescoped into it, a series of concepts. So that if we accept the term we are accepting concepts, if we don’t understand the concepts we are accepting we will actually be determined in our thought process, by it. The thought process will be mechanically determined by the terms employed. When we use the word ‘term’ in logic, we are using a word signifying a word used in a specially, clearly defined sense. If you say a ‘word’ you are not being as precise as if you say a ‘term.’ A term implies that you have a word which has been very carefully defined. Now let us consider that if evolution signifies that something is coming out of an ultimate reality or substance the problem raised is how can that which coming out have got in to that original reality? 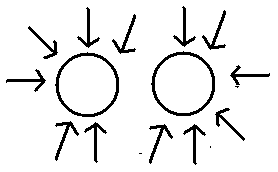 So if I write down here in vol and I can make ‘in’ signify as a diagram, a closed area with some energy entering that closed area, and I make ‘vol’ equal volition or a turning in, as in the word ‘volute’ then, if something turns into this area, I have to posit that what is turning in, was already, prior to the in-turning, out. It was extended in space before it posited itself in a locus or finite situation. Now if I talk about evolution, I am using the word E as a short form of ‘ex’, out-turning, then I must say, something is inside that which is under consideration, which we may call substance or original reality, that which is turning out must somehow be in. But if I define it, if I start with the substance with certain qualities within it, I must say the qualities either got into it from outside it or they are inherent in it itself. Now, if I say they got into it from outside I then have the problem of what were they outside, what is the meaning of outside existence? If I posit that it gets out I have the problem, how did it get in? If I postulate that it gets in, what was the situation that was out before it got in? Both of these things are unanswerable right from the beginning of the argument, but if we say there are inherences there are essential powers which are reality in the original, these essential powers can function in the manner we call involution and out-volution, in-turning and out-turning and by postulating that the powers themselves move, either towards a centre which is involution or from the centre, which is evolution, the argument shifts from the relation of involution to evolution to the nature of the inherencies in ultimate reality. The idea of starting with substance is quite simple that the Greek Thales, who postulated a primary substance, was, in fact, standing on the Earth. He wanted to know what was it that was firm, the least unshakable thing in all the things around him, the thing that he could find and stand upon and say, “This thing will not change,” he was looking for an unchangeable. When he looked at the earth upon which he stood, he found that this earth was in certain places, dry and he could not imagine, by examining this dry earth how it could become wind, fire and so on. So he looked for something else, he found humidity in certain parts of the Earth, apart from the fact that as a Greek he is surrounded by the ocean anyway, he then decided that because water could exist in various phases you could take liquid water as a sort of mean and say that if you heat it it will become invisible water vapour and is you freeze it, it will become a solid. But he wanted something that would be conserved through all changes. He chose water because of its flexibility, its plasticity and this strange fact that you can freeze it and that you can boil it and turn it into invisible vapour and so on. So it was not a bad guess. It was easier to imagine that water could become ice and water could become vapour than it was to imagine that Earth could turn into water and then into air. It was easier because he had the evidence of this change actually there. He could climb up the mountains in the winter and find nice blocks of ice; he could watch them melt in the spring; he could catch them and put them in a pan and boil them or even go to a volcano and boil a bit by travelling a little further. So he had here an evidence of something that he called ‘stuff’ of the universe and this stuff, he said, is quite probably water. Other people said, “Well water isn’t dynamic enough on its own, what is it that moves the waves on the sea, it is air, that perhaps air is prior to water?” Another man thought fire because when things are hot; when the Sun is hot it creates movements of the air. There was a quite distinct difference of thought pattern in the man who is looking for substance, something enduring and unchangeable and a man who is looking for primary cause. When you think about causes you are thinking about forces, which, when applied, produce changes. When you think about substance you tend to think about that which is fundamentally unchanging. So we have here, right from the beginning two opposed concepts, a concept of an enduring unchangeable substance and a concept of a dynamic cause which is continuously changing its forms and mysteriously not being a substance at all. A substance is something which you can in principle, conceive yourself to stand upon. It is sub stantia, it is underneath and you can stand on it. Now fire is not underneath and you cannot stand on it, not comfortably. Heraclitus thought to himself fire is a better bet than water because it is concerned with causation, with forces, with power, with changes and the induction of changes, but that merely said something about his temperament. We saw here two temperaments very obviously opposed, a temperament concerned with stability, those who like to believe that substance is ultimate, and another temperament concerned with causation who like to think that energy is basic. Now, factually, in the Twentieth Century, we know that matter can be destroyed and be turned into powers, into forces, into energies, and in this process of turning it into energy we are turning it into something on which you cannot stand in any firm manner. The universe of the Twentieth Century is far nearer to Heraclitus and his fire theory than it is to Thales and his water theory. Now if we conceive what today we know to be a fact that if forces are made to condense, if we can tie them up by any trick or device and locate them, these forces will then behave in a manner such that a consciousness from outside will interpret them as matter. Matter is energy locatable and offering a resistance. We cannot explain energy in terms of energy-less particles, we can exchange the concept of rotating energies for material bodies. So therefore, when we come to consider involution we must say to ourselves that our governing concept is one in which we are vectoring, we are directing a field of energy. Here is a field. A field is a zone of influence, influence is in-flowing-ness. Imagine a field which is indeterminable in its extended form but it has this peculiar attribute of being able to precipitate itself on to a centre. And, when it does so it brings into being, by the meeting of these forces what we call, an existential, material object. An existential, material object is then viewed as a precipitation of a field, the field itself, from the point of view of modern physics being a space-time continuum of energy. When it presses into centres in any given locality, it produces, by the in-pressing, the in-volving, local zones of compaction, which, relative to the space between, can be called ‘bodies.’ These b odies now constitute the possibility of a granular analysis of reality. Whatever has been involved into the zone we call material body, the attributes of that which is involved are now inside this zone. We have therefore to say that if we accept the hypothesis that matter is precipitated energy then the attributes of energy are in the matter, so that if we release this matter from its condensed state we will rediscover the attributes of the field that precipitated this matter. Now, in the case of an articulate human being because a human being can actually think, feel, will, co-ordinate and embody by self condensation these processes, we have to say, that prior to condensation, prior to this self-precipitation this field is able to think, feel, will, co-ordinate and incarnate. It has these attributes of itself. We cannot conceive this field to be lacking something that we manifestly have so we have to say that the original reality from which we derived in some mysterious way is a field of intelligent energy thinking, feeling and willing, self-condensing to make bodies. The whole process from the field into the body is then called involution. Now, supposing we say that when we condense particles in the field in this way we can conceive that because the field is sentient, it feels, it will feel in itself these particles as zones of resistance and experience them as physical bodies, primary atoms, molecules and so on. In the act of feeling them, it is in danger of focussing upon them and forgetting the area between these particles. Between these particles in the field, this field is very, very fine. If I bang my knuckle on here it makes a bigger noise of a low frequency than it does if I bang it without knocking my gross physical knuckles on the board. But, to a very, very fine, perceptive organism, this banging without touching at the gross level is actually louder than the other. A greater increase of sensitivity would mean that instead of hearing only noises of the gross order, we could hear the imagination knocking on an imaginary wall, and if we refine our instrument of perception the noise that we could hear would be amplified way beyond the banging of a knuckle on the board at the gross material level. We can therefore say that the field can devote itself to a partial structure, a molecular structure, an organism, and forget the subtleties of the field round it. And when a being arises that can devote itself in this way to the concrete, gross material we have got a materialistic, empirical scientist. Now those of you who have watched a cat looking in the air and dodging invisible entities and clutching at them and standing up very alarmed can say, either the cat is mad or it is aware of something that the grossly materially focused man is not. The Egyptians made the cat sacred for a variety of things. The lowest cause of its sacredness was the fact that it could kill rats and mice, another one was that it could be trained to catch ducks and other things, but there were various other more subtle ones that the cat was very sensitive to other forces than the gross material objects that a finitely focused man is tuned into. Therefore we can see that if we actually focus into this knock, knock level, if we imagine that we continue to do this and we define as real only that which makes a noise, (like this), we will arrive at a corpuscular theory of reality. We will lock in space energies of our imagination in a concept of granularity; we will do that because our experience denies this all the time. If I look round this room and start counting heads, I am doing that deliberately, heads are the hardest things you have got, I hope, and therefore it is easier for me to keep them discrete. But if I tried to count heat auras from your body I would find it extremely difficult to separate it out. If I looked at David with infrared type eyes I would see that actually he is encroaching on Zero with his heat aura. I might think he was actually being cheeky if I did not know that he was married, so that only at a certain low level, can I use a discrete counting system significantly. At other levels, I will be forced to become looser and looser and looser in my analysis, until at the top level, it will become quite fallacious, and that is what the word fallacious means, quite fallacious to think there is any discrete, separable existential entity in the universe. At the top level we are dealing with a continuum which is higher than the concept of energy of physics, a process that has to be verified with instruments not yet developed, instruments so refined compared with modern electronic devices, instruments that, in a thousand years will record what today cannot even be conceived as forces because they are too fine, forces that will go through a Faraday Cage which would stop electro magnetic waves but which cannot stop something else for which, a term is needed, a term that is absent in modern physics. Every science has to develop terms to keep pace with its own concepts. Certain new terms will emerge which will cover new types of sensitivity now very rarely found. but which will become, in the future, common properties of sentient human beings. Imagine, that if we concentrated on the knock, knock world, and we agreed between ourselves that we would say that is real which makes a noise when you kick it and that is unreal which does not, we could become gross material empirical scientists. We could go round kicking everything and writing in a book what happened when we kicked it, we could make nice, big, fat books of statistics of the way everything falls apart when you kick it with a certain force over a certain number of times, and so on. But this peculiar world would actually be an abstraction. It would be something that our intellect had fabricated from itself. Now, imagine, in the Twelfth Century, human beings were quite capable of going down the road and saying, “I have seen an angel today,” and they would not mean a gross, material, physical body. If they had a vision which say modern psychologists might call a projection or an hallucination, they did not think it was any such thing. They attributed to it exactly what it was, an existential reality of its own order. If they saw a ghost, they did not think a ghost was a non-ghost called figment of the imagination, they thought it was a ghost. Now actually, you cannot conduct an industrial revolution with people like this about. And, therefore, the Industrial Revolution had to get rid of ghosts. Imagine, supposing you wanted to erect a mill and the place where you wanted to erect it happened to be a convergence of rivers because you need some water, but it happens that four hundred years ago a man barbarously murdered, that is for the lady on the back row, barbarously murdered his three daughters and his wife in a fit of bad temper. Now any sensitive person going there starts shaking violently. Now, until a man invents some kind of industrially useful thing that needs shaking and puts it in the hand of these shakers it is no good. So here had to be a new philosophy, a philosophy that denies all psychic forces and insists that that is real which helps the production of cotton or wool or whatever you need to produce. After a few hundred years of this kind of concept, people actually came to believe that everything that they cannot kick is hallucination. And of course, this means to say, large areas of possible experience, recede from the mind, because when this sentient field, which we loosely call the mind, the evaluator, focuses down to a certain level, for it other levels cease to be functional. Now, we come to a point where we can say the dead end of involution is the Moon. The Moon as we know it, examined by astronauts is something you can go up to and stand upon and jump about on and behave like a fifteen year old fool, and forget what you went for and so on, and it has no organic life on it, we can say that the Moon is the end of minerality. The MN in mineral means that you can count it. Now the mineral world is very useful, it is like the Moon. You know that you can count the Moon because it is not likely, statistically, to effloresce, grow plants overnight and these turn into things that you get on TV plays and these become metamorphosed into animals and these into strange, spatial-type beings of no bodily abode and disappear, so that the next time they come to say, “What time of the Moon is it Sylvia?” she says, “I am sorry the Moon has disappeared.” Statistically we expect the Moon to remain and therefore, we can say of this Moon, it is good to call it the dead end of involution. In Indian thought it is a place devoted to ancestors. If you go to the Moon when you die you will come back to Earth and start breeding babies because you are on the way called pitryana, the way of the ancestors and this is because in Indian philosophy they conceive minerality itself, to be the dead end of a contracting field. When it can no longer contract, when it has reached its final compaction, we call it ‘end’ and you Latin scholars know that EN is giving you a base that you see in entity, ens, and so on, which means being. But the letters actually mean ‘field motion’ and when we put a D on it and say en-d we could really write E for a field, N for the motion and D, here so, END means a field moving till it divides itself from another moving field dividing itself. S elf-precipitation here, self-precipitation here results in a division between that centre and that centre and this is what we mean by end. An end is an involutionary movement carried to its term. When it cannot further contract it is what we call minerality. A mineral is that which is so established so secure, so relatively unchangeable that we can suspect it will be there tomorrow. The diamond that your wife has, bought by you out of the great love that you have for wives and diamonds, you give her that diamond and it is so hard and shiny she puts it in a draw, you know it will be there tomorrow, if a burglar has not come in in the night. And if he has, you know that it will be somewhere else. So, the thing about minerality is you have a very, very strong belief that you will actually be able to locate it, somewhere in space and it is so hard that you tend to believe and people have believed, for a long time, that diamonds are indestructible. Factually, of course, they are destructible because they are only energy. But it is quite hard to reduce diamonds to wavicles of force, but it is in principle, possible. The amount of energy to do that is very high. Now let us have a look at this concept of ‘end.’ End means the field has moved in such a way that it has produced precipitations in different zones and these zones of precipitation can be conceived to be divided from each other. Now, the division between these fields is not an ultimate division, it is an effective division. Now effective means ex-factive, it is ‘out’ ex and facere, to make, to do. When we come travelling along and get stopped, we come to the end of our journey, for the time being. We know that this field has simply vibrated towards the centre and produced this phenomenon called primary particle. We know that the other primary particle is simply an evidence that the field has moved towards another centre, outside the first centre. But, we also know that the field itself is a continuum which is utterly beyond the possibility of disruption so there is no absolute severance between two centres which we call bodies. All bodies are modalities of a continuum, the attributes of which must include thought, feelings, volition, co-ordination and possible self-condensation, which we can call incarnation. Now, if we make a mnemonic of the process we can draw ourselves a primitive type hand, neo-primitive hands cost forty thousand pounds when well painted! The thumb we are going to call power and I want to use this word power here in a special way. 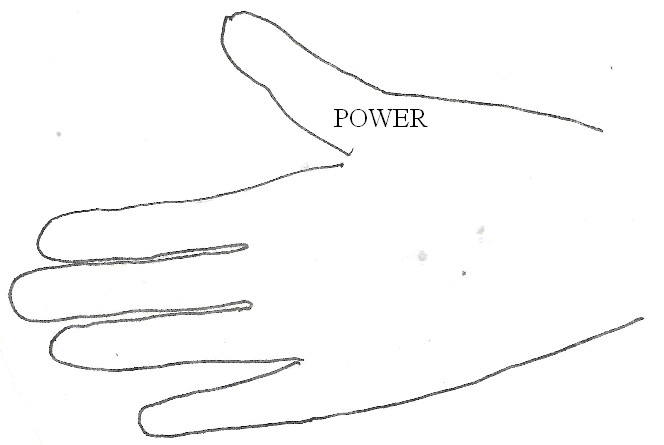 The etymology of that word ‘power’ actually comes from a word from which we get the word ‘push’ and the word ‘wer’ which means ‘man,’ whether you spell it Latin-wise, VIR, or Teutonic-wise, WER as in werewolf, it is the same word, power and man, push-man. You push things with your thumb. But we must distinguish between the use of the word power in philosophy from the use of the word power when you are considering problems in physics and mechanics and so on. Power as a rate of work done is not what we are talking about. We are talking about push, that which produces motion and which is inherent in ultimate reality. Now, imagine that we have a field, that is an area of influence and that this area of influence receives the name power which means that the field itself can actually push, like a man pushes, but then we have to remember that man means an evaluator, so we have to say that this field is a self-evaluating pusher, sounds like a description of a friend of mine. Now when this field of power presses in to centres it produces forms. So, on the next finger we shall write form. That is my index finger, a thumb for a pusher, my first finger the i ndex finger. When I use my index finger I do it to indicate forms. Now, remember at this point, we are not talking about the concept of matter or the concept of substance; we are talking about shape divorced at the moment from the idea of substance. We can visualise a sphere in our imagination, or in the air. If you are very good at concentrating you begin to see one and then if you are very good at losing control of yourself when you have seen one you can go away and have a rest, under somebody’s care, of course! When you formulate in this way, you are generating what is called an idea, so we will put idea under there as well, and, as the subject matter of thought and intellect is called idea we can say that this index finger pertains to your intellect. Remember this is a mnemonic device. 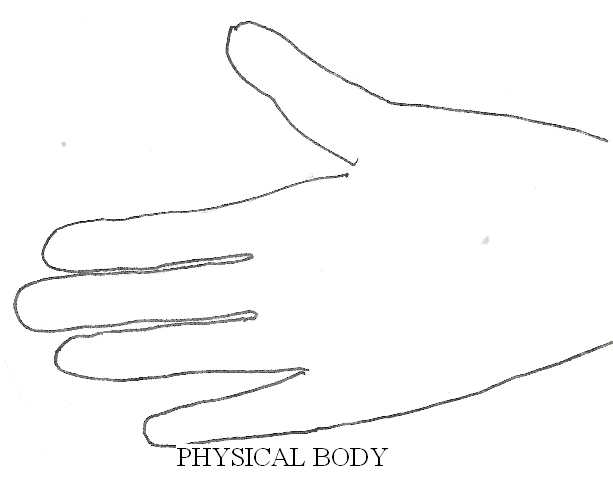 If we wanted to prove ontological validity for this, and neurological significance for it we can do so, but for the time being we will simply say that in the evolutionary terms the thumb has been used for pushing and the first finger for indicating forms, and a form in your mind is called an idea. That is why, when men get ideas and talk to each other, they emphasise their ideas with the first finger. What they are really doing is indicating, authoritatively the forms that they have in their mind If you find a man that is wagging his ring finger at you like this you feel that there is something wrong with his authority! Men that wag their first finger at you when they indicate something are usually being rudimentary! The funny thing about the middle finger, is pertaining to Heraclitus and his fiery philosophy, and as fire and first are the same word, funnily enough, your middle finger in his philosophy corresponds, and is the mnemonic for fire. 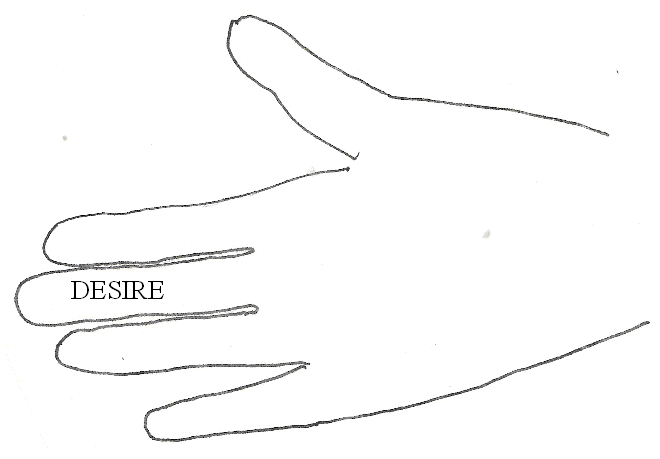 But, in this analysis, the middle finger, we are going to put the word desire down and w e are going to put for it preferred response, a pre-re, a preferred response. When you apply your pushability you give rise to a form. That is if you move about with great energy with your eyes closed, you will meet forms and in the process, those of you who have been to Essalom to be theraputised and have had your eyes closed and put those hands on forms in space, will find a peculiar thing. 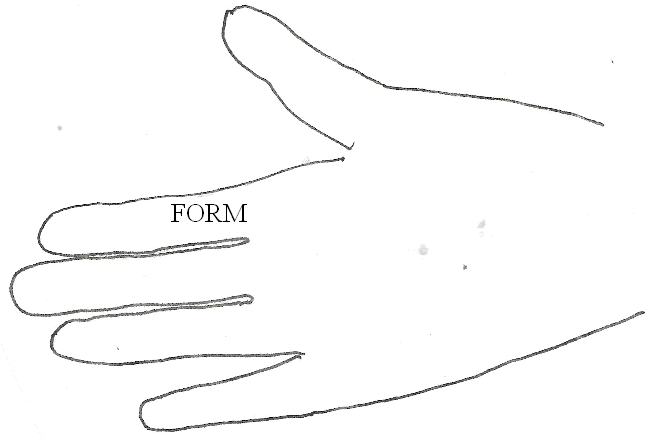 You put your hand, with your eyes closed, on one form and you find that form is uninteresting. You put it on another one here and you find that is less interesting and you put it in a form there and you wonder whether it is safe! Now, this middle finger here, we shall use to remind ourselves of preferred responses which we call desires. Remember we are talking about involution. A field of power, that is influent, flowing in, precipitates a form, the same field of power investigates the form and finds to form is pluralized internally and that it has differences within it which give rise to preferred responses. Each form behaves in a different way. Now, when this preferred response is selected from total reality a field of power devotes itself to that zone. This is a very important thing. The desire, the preferred response is the action of the power on the form. The form contains, dialectically, an infinity of possibilities of action, an infinity of formal distortions and some of these are selected, and the power then devotes itself to the selected forms. We then have a situation in which a form selected has power drifting into it and circulating round it. N ow I am going to write on this ring finger, biofield because when the power moves in, involves to the form and selects within the form that which it prefers and devotes itself to the preferred a certain amount of energy wraps round the chosen form. 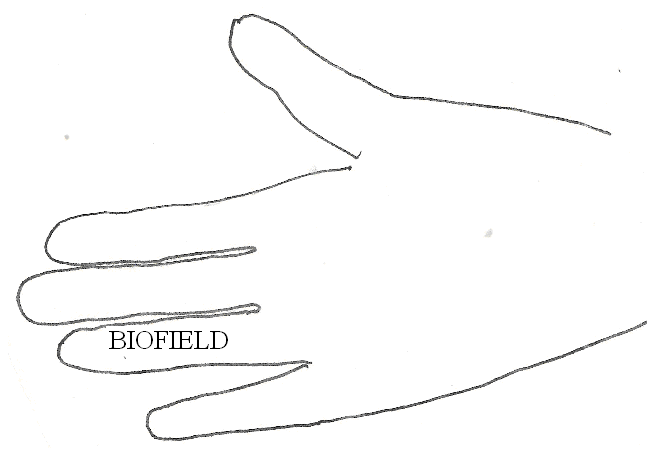 And that is the Biofield, a field of life for that form. That means that wherever we have an interest of a biased order, if we prefer one thing to another, we wrap a certain amount of energy round it. We say we are being possessive when we do this, if we think it is worth responding to we want to put it where we can get at it so that we can give it our preferred responses. The energy that we precipitate round it is a biofield, that is, a field of life energy. From the Absolute Power there is a step down to formulation because all formulation is by circumscription. 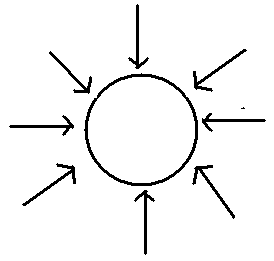 Circumscription makes the shell of energy round it so that the energy outside is freer than the energy on the inside and in passing through the enclosing membrane a certain amount of energy is expended and therefore, when the energy has got inside it is slightly weaker than the energy outside. And therefore, it is confined within that membrane, it is an encapsulated energy. When we have selected the form and given this analysis that causes preferred response, desire, and we devote the energy into that field, the energy so devoted is a biomagnetic field. Once we have such a zone, supposing we have a lot of zones like this, and we select one and we press into that one all our energy, we push our will power, we condense our form we d rive our preferred energies into it, we have made a biofield into which we keep pushing more energy. 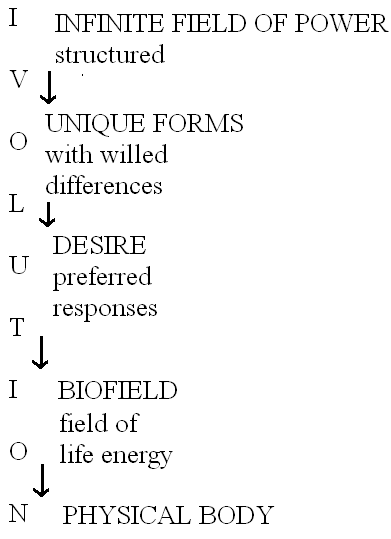 This is ingestion, involution of field energy into the pattern of a preferred response. The result is that we have a physical body generated inside the biofield. Now the whole of this process is involution. We can say that the body of a human being when it is alive and moving about, the fact that it is animate, that is it can move, means that there is a biofield there. You know that you can get a living tree and you can cut pieces off that tree in the act called pruning and the tree will respond by growing in another direction. And you may do this for a number of years, and one day you go, you don’t need to prune it, it is dead! If you now examine it, you find it has no biofield. There is a measurable bio-magnetic field wherever there is a living being and that field is not caused by the body but is the cause of the body. It is that field that has drawn into itself those primary particles or energy quanta and packed them in and made the body within the field. Therefore we can say, if we examine the body of a human being and it is animate and running about and disagreeing with you, and things like that, then we can say it is a biological entity, it is an entity with a field of force round it which makes it live. It can grow, it can ingest food, break it down, reduce it to energy and use it for its own purpose. And then, if we find a being is running about and we observe that this being runs in some directions and not in other directions, we can say that that being has preferred directions. The fact that each species of animal tends to pursue its own species is an indicator of preferred responses. When a certain animal chases another animal, it has, inside itself, a function which is a response that it intends to give to another member of the same species if it can catch it. The Bio magnetic Field itself, when observed will always show preferred responses in it. It is vectored, it is directed with a certain amount of force in certain directions. So, wherever we find a body which is living we find a bio field, wherever we find a bio field we have got a system of preferred responses. Now, wherever we have got a system of preferred responses we have form. The fact that a kangaroo chases kangaroos and elephants chase elephants and so on, means that in the psyche, in the level of sentience of that being, there is a form and that form is related to the involution of power that has, after precipitation, pluralised itself in the process called generation of individuals of that species. So the forces that condense and become elephant, are formally different from the forces that condense and become lounge lizards. All the forces that there are, that condensing in a formally different way. When we find a zone of preferred response, we know that there are forms inside that being that are already stressed and precipitated in a certain way and this is very important for conversation with human beings because if we meet a body in a train and this body is snoring, unless some electronic wizard has put a snorer in his hat to fool us, he is alive and he has preferred responses, like sleeping on trains on long journeys and so on. We know that he has a form inside him and therefore we can wake him up and cross-question him about his forms, and why glissando and not in steps like a diatonic scale, and so on. And because he has form, he will respond, in a formal way! It is a very interesting experiment, I love trains for this very fact. Last time I was on a train, doing this with a fellow a window suddenly shattered and illustrated a point we were about to discuss and I said to the window, “You are a bit quick, I have not got that far yet.” And we all filled our pockets with bits to remind ourselves of this conversation. Now there is a hidden form inside every preferred response. Now, because every form is an encapsulated zone of energy, we know that this form must have been hidden inside the power so we are forced to say that the field power which is the origin of all things and which involves progressively, down to the physical body level, this field power, mysteriously, is structured. It is not plained; it is not through itself everywhere identical formally. It is only a continuum with sameness as its quality provided that we don’t say that sameness means identical form in different areas. We have no ground whatever for assuming identity of form in two zones in space. To the contrary, we have every justification for saying that no two zones of space can be formally identical in their energy pattern. Now, let us imagine what we have done. We start with an Infinite Field of Power, this Power, because it has all the qualities that we have without which we could not have expressed them, this power field is structured because it is power, power is not doing nothing, it is doing everything; and in its criss-crossings and interweavings it produces an infinity of forms and, in no two zones of space are those forms identical. So that, every form that is produced within it is unique, two forms, which are adjacent to each other in space, are not identical and cannot be. One is nearer or farther from a centre of earlier precipitation or more intense precipitation. One is peripheral, one may be vectored peripherally, the other towards the centre. No two are identical and therefore it is a waste of time from the word go to try to find a person with whom you will agree absolutely formally. It is impossible. The more you discuss, the more differences you will find except for one fact, and that is your will to differ. This is very important for coming to harmonious conclusions in debate. If you accept that in any two zones of space the precipitation is unique, you can see the enrichment of the banks of the Thames, the enrichment of the field by this infinitely various process of self-precipitating. Therefore, if you imagine a conversation between two beings, if they think they are going to come to formally identical conclusions of the end of their debate, they are already wrong. The longer they debate the more differences they will discover, except for the one fact, that they are willing their differences. Now if they didn’t will their differences, if they were able, if they had enough control of their energy to will not differences but identity, they would suddenly flip together like two monocells do, if you watch them under a microscope. It is possible, that two beings, in different places, could actually precipitate themselves and occupy the same space. And this they would do by agreeing to resonate in the same way. There can only be agreement, formally, between people who will the same form and this they can only do for some wilful purpose. This means that if you do agree with anybody it is not because you agree, it is because you will to agree. Your agreement has no validity than your will to agree. Now, we have an Infinite Field structured because it is dynamic, structure there does not mean rigid, it means that the powers that are passing infinitely through space are, in their criss-crossings, weaving a mesh, a mesh of power which, because this power is sentient, it sees as itself, self-experience, self-inperience, and in looking at these weavings of forces by focusing on them in particular ways in particular zones, it can seize and relatively freeze for a time being, a given form while it examines it. In the same way, if you look inside your mind on a sleepless night you will find that the forces in your mind are continuously weaving all kinds of forms. You can practice sharp focus on one of those forms and the moment you do so, you energise it, it comes out of context, the others begin to fade away. Or, you can deliberately relax more and more until the associations between these forms are no longer conducted by formal relationships of the logical order but by emotional charges, that is, by like-dislike tendencies in a field of sentience. This infinite field is structured from eternity. Eternity is not a lot of time it is simply that time is a serialisation of certain functions within that field. The Field itself is beyond the concept time. Time always implies an energy emission. But as soon as we descend to the level of form, in the act of creating form, that is encapsulation, we have created the possibility of time because time implies that we have a clock; and this clock implies that some order of rotation is occurring to make a cycle of observations. When we come into the realm of form therefore, we are already entering into the realm of time. When we get to preferred responses we further energise this time and when we pour further energy and make a magnetic field and ingest it into a body, then we have brought time into a more condensed, and if we kill this body and finish up with minerality we then have a particle like the Moon which can serve as a fairly stable measurer. The whole process is one of involution and nothing has gone in to that body other than qualities to which the Field must be viewed as Father. That Field is God the Father; this form is God the Son: this preferred response is the Holy Ghost; this biofield is the life and this is the body. So if we say God the Father, God the Son, God the Holy Ghost, life that issues from those three and the body; then we have a thing here that is quite easy to reconcile with a trinitarian Christianity or with certain high philosophies of India and elsewhere. Always the concept of the Father is the pushing fellow because in primitive societies, this is excluding America, the father pushes. This pushing father generates an idea which he calls his son and he tries to nail the idea to do what the father wants, like keep the business going. And he thereby tries to create a preferred response in the son and if he manages it there will be some biomagnetic concentrations on the business. But terrestrial fathers have not sufficient energy to force their sons in precisely the same way that God the Father could have done. But, of course, this field of power called God the Father has not got these values of a time conditioned human being because He is an Eternal Power, therefore when He involved He is not trying to make a concept of a body of people, a community of identical thought. We take an example in church history, we find right of the beginning of Christianity, after the statement, “Love God and your neighbour as yourselves and be ye conformed, one to another, etc. etc, etc.,” the idea that there is a community that will have exactly the same ideas about everything, and this community will be called the Kingdom of God, that is a pipe dream. Factually, right at the beginning of Christianity we have tremendous disagreements, we have factions everywhere. We have men who believe that Christ is really God and other men that believe he is only half a god; some that believe that he is just a very clever fellow; some who believe that he is an idiot who had no political insight and so on. These are all different point of view and the winner of all the arguments who actually used an army to enforce his argument defined the others as heresies. Heresy of course, means I do my own thinking. But, in this process of involution we have to continuously remind ourselves that when we examine inside our own organism we will always find unique processes; unique processes of thought, of feeling, of will, unique modes of co-ordinating these, unique modes of incarnating them in the physical body so that we must never look for formal agreement with other beings. We must look for something totally different namely, two kinds of beings. Beings that know that they are wilful in their definitions and beings who think that their definitions are valid independently of being willed. The first kind who know that they will their definitions are Franciscans, and the second kind who believe the thought is there and has power to condition the will are Dominicans. This means that as far as we are concerned as human beings, each one of us has a unique mode of internal involution. The western concept of evolution is that we have come from a very low type protoplasm, we have been like an amoeba and we have been like fish, we have been like lizards, we have climbed out and we have finally become man in a most mysterious way. This other view says that if we examine ourselves internally we will find, within our body, first animation, the Biofield; second, preferred responses; third, forms behind our preferred responses; and behind those forms, will. We are actually biased, bias, bios. Our life is a bias and if we accept this bias and then say, “How very interesting that there are so many biases, what a rich world it is, how beautifully we disagree,” and say, “Disagree some more with me. It is terribly interesting.” This is highly intelligent Christianity. To recognise that all formal precipitations are willed; that uniqueness is an essential intent of the original power field called God the Father; that God the Father does not want a world full of identical beings all reciting the same wisdom culled from O level at the same time and the same delivery in the same standard English. But he wants them to say it in totally different ways and preferably not even to say what is in O levels. He wants them to discover other things and within the things they discover, other things, and all of them totally different so that no two men can understand each other formally and don’t want to. What they want to do is see what marvellously tricky things they have produced by act of will. When we can see that this is a fact that our physical body as animate is evidence of an animating principle, which is of solar origin, solar energy is this bio field, preferred responses, forms or ideas, and will, when we recognise this then, and not beforehand, can we talk intelligently about evolution. Which means that we have to bring out, from our beings nothing other than that which is in. Education means leading out, indoctrination is pushing in. The indoctrinators, say of the fascist or the extreme left, the brainwashing fraternities, like to get rid of the forms you have got and put other forms in your mind of acceptable doctrine. And the fundamental will of the universe does not like this at all and therefore we can say that God is a most peculiar fellow and is anti-fascist, anti-communist at the same moment. He doesn’t like any attempt to reduce the number of forms as designed by finite human beings, who, aware of their own finity of direction, would prefer in order to retain power in their own hands, that your preferred responses shall be those which they shall design for you. Now, it is quite understandable that at the very highest levels of government, there must be intelligent beings and these intelligent beings have a very good, fundamentally good, evolutionary intent. But, below these intelligent men, there are other men whose intent is simply the pursuit of individual power. It is not the top rank of government that does stupid things like trying to make everybody equal, it is a lower level who, conscious of their own inferiority of power, wish you not to effloresce, not to be different in ways that they cannot handle, but the fellows at the very top who are very, very alert, love you to be beyond their handling because they are so quick that whatever you produce they will show a profit from it. They donot ‘need to handle it. They have got the middle fellows to handle it and they will get the benefit. So here we have a thing that is not a bit like George Orwell’s 1984. He thought that Big Brother would control you and having built television screens there which you are not allowed to turn off, you are in continuous observation, you are receiving continuous orders, you are predictable. This is a very low level ambition of not very bright politicians, but above them is something quite different, a real establishment of intelligent beings who are determined to aid the evolution of the human race to very much higher levels than they now possess. And the only way they can do this is to put the squeeze on. An Ancient Egyptian word piez, which comes into piezo-electricity, is the kind of electricity that is generated when you get a body of matter and squeeze it. If you put a crystal under pressure, it will generate electricity, this is piezo-electricity, squeeze electricity. Now this higher establishment will squeeze people to make them produce new emergents, whereas, at lower levels people are trying to squeeze them to stop them producing new emergents. But you see the lower level if you were trying to control people by squeezing them, are self-contradictory because they do not understand that when you squeeze people they produce new emergents, whereas the fellows at the top love the idea that when you squeeze people you get a new emergent.